CES is far from a top-tier trade show for the digital imaging industry, but that didn't stop manufacturers from introducing new models. Android returned to Polaroid's booth with the underwhelming iM1836 ILC, Canon opted for a square form factor with its PowerShot N and Fujifilm introduced a more powerful version of the X100. Nearly all of the cameras we saw at the show were created for consumers, with many options coming in under the $200 mark. Nikon and Samsung offered a few exceptions, but with Photokina wrapping up this past September and CP+ kicking off in just over two weeks, there are plenty of other venues for camera makers to introduce their higher-profile models. For now, though, it's all about CES, so join us past the break for a closer look at some of this week's biggest announcements. As they did last January, and nearly every year before, pocketable compacts made up the majority of the camera announcements at CES. Canon, Fujifilm, Nikon, Olympus, Panasonic, Pentax, Samsung and Sony all had new point-and-shoots to debut, and while many represented mere incremental updates, a few models managed to stand out. 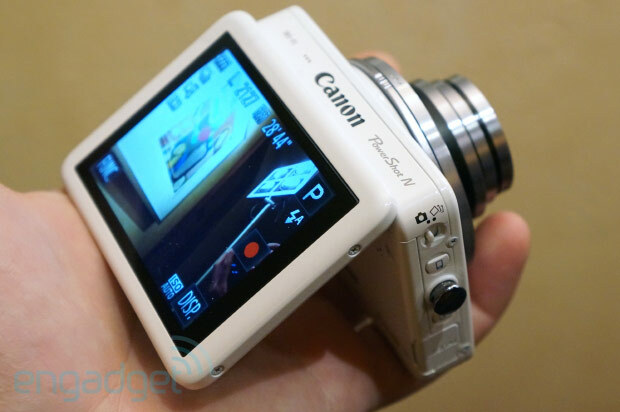 Canon's PowerShot N was perhaps the most fascinating in this category -- the square design certainly caught us off guard, but it appears to have been well received, despite the $300 price tag and odd form factor. The N is a great fit for lefties, too, since the zoom toggle and shutter release are positioned around the lens, and can be accessed just as easily from the left side as they can from the right. Nearly every manufacturer had WiFi models to share. Some potential customers consider wireless connectivity to be as useful in a point-and-shoot as 3D stills shooting, and we generally don't disagree. Still, successful implementations make it possible to capture otherwise difficult group self-portraits, or to send images straight to the web. Where WiFi becomes most useful is with Android-based cameras, enabling an enormous amount of additional features, from custom app installation to the ability to browse through your friends' photos from the same device used to capture your own. We weren't necessarily expecting Polaroid's $400 iM1836 Android-powered mirrorless to be a worthwhile addition to any serious photographer's camera bag. Somehow, we still managed to be disappointed -- the camera was incredibly buggy, and we were far from impressed with the device's construction. Of all the company's interchangeable lens camera introductions, however, the Android flavor was the only model that didn't feel like it would shatter with a 2-foot drop onto a pillow. Polaroid also took a bizarre approach with the bundled lenses themselves, installing the sensor just behind the lens barrel. In other words, when you remove the lens, the sensor comes with it. As much as we'd like to give Polaroid some bonus points for innovation, we fail to find such a design compelling. Samsung also had a mirrorless camera to share, and even though we could have squeezed it into the paragraph up above with Polaroid, the NX300 deserves to stand on its own. The company's latest model packs an APS-C sensor that can snap 20.3-megapixel stills, along with a typical 100-25,600 ISO range and a 3.3-inch AMOLED touchscreen. 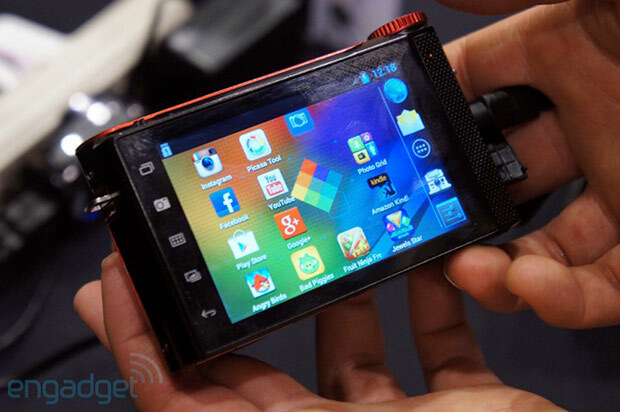 It also shoots 3D stills when paired with the $500 3D-capable lens. The camera itself (with a 20-50mm kit lens) will set you back a cool $750, so it's clearly a class above the Polaroid -- it's also one of the priciest cameras to debut at CES, which only serves to further validate our claim that this show is targeted at consumers. Finally, Nikon introduced its J3 and S1 -- a pair of decidedly consumer-oriented mirrorless models. That first flavor comes in at $600 with a kit lens, while the S1 will be available for $500. Both are designed as step-up models for current point-and-shoot owners that value design and "fun" features over sensor size, low-light sensitivity and image quality. That's not to say that we expect either of Nikon's new 1 series cams to offer image quality or durability on par with any of the cameras from Polaroid, but if what you're after is sharp shots, even in low light, there are plenty of better options, most of which launched weeks or months before this show. If you're not taken with any of the models that launched this week, you may want to wait until the end of January before pulling out your wallet. CP+, the up-and-coming Japanese trade show focused on the camera industry, kicks off on January 31st, and we're sure to see at least a few more compacts debut in Yokohama.